When it comes to exercise, long and slow or hot and fast? 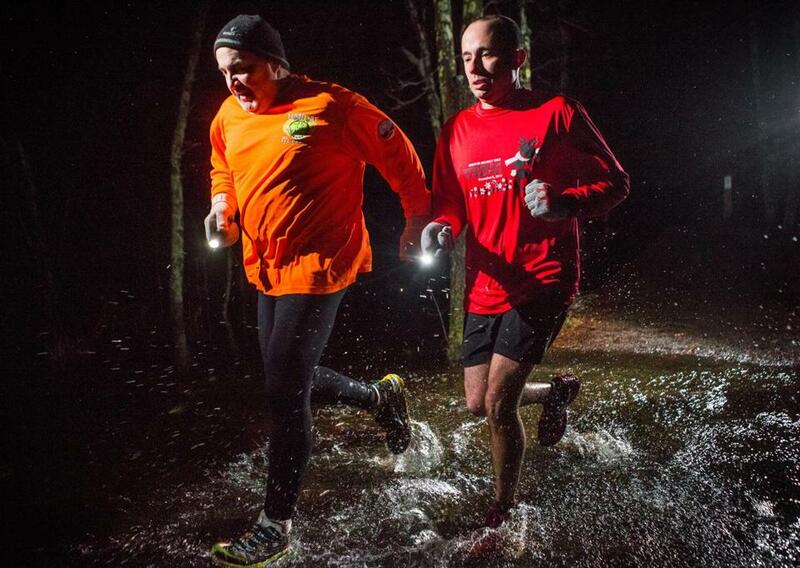 Jim Gilford (left), 57, of Topsfield, and Roger Martell, 43, of Beverly prefer to run the wooded trails of Bradley Palmer State Park in Hamilton. Anna Prebluda working out at Burn Fitness. James Gilford runs 30 miles per week, mixes in some swimming to spare his knees, and takes just one day off to rest. In all, the 57-year-old owner of Gil’s Grocery in Topsfield devotes about 10 hours each week to an exercise routine that has served him well, with only slight modifications, since 1985. Gilford’s regimen is a classic endurance fitness formula — a sizeable commitment for a small waistline. But some trainers believe such time-intensive workouts are outdated and unnecessary and are winning converts to a shorter, faster-paced exercise strategy known as high-intensity interval training, which promises to deliver similar health benefits in less time by alternating between quick bouts of maximum exertion and brief moments of rest. For years Kristen Malerba-Smith, 42, kept in shape through long, steady endurance work, competing in half marathons and 100-mile bike races. Since she became a mother about a year ago, however, the technology advertising executive has switched to interval training. As the muffin-topped masses sweat through the first month of another resolution to get fit, a familiar question looms: For those with busy schedules, what’s the best and most effective way to do it? Longer stretches of continuous, moderate exercise, a la Gilford, or intermittent spurts of heart-pounding work in shorter sessions, like Malerba-Smith? It turns out the answer depends on several factors, including your personality and fitness goals. If your dream is to run a marathon or if you simply prefer more meditative activity, there’s no substitute for a jog. But if you’re looking to lose weight faster and like things lightning fast, you might be better served by all-out intervals that require quick energy. And lest you think one training method is overtaking the other, consider that both are growing fast. In the past two years CrossFit has roughly doubled — to more than 10,000 — the number of affiliated gyms practicing its brand of intense exercise routines, which include rapid-fire sets of pullups, rope climbs, and kettlebell swings. Many other regimens, from boot camps to “burst” training sessions, are based on a similar principle: raise your heart rate to its max for a short period of time, take a quick break, then repeat to achieve results. ultramarathons — which extend beyond the 26.2 miles of a standard marathon — more than doubled between 2008 and 2013, according to research by Ultrarunning Magazine, hitting 69,573. Novice exercisers may be frustrated or confused by mixed messages about what works. Ask a CrossFitter and a runner, and you’re likely to get very different answers. “Every single one is a rabid evangelist for their way of life,” said Brent Ruby, director of the Center for Work Physiology and Exercise Metabolism at the University of Montana. In fact, neither is gospel truth. According to Ruby, both can be effective — he’s switched between styles in his own training and says variety is good. The perks of endurance training are well documented in medical studies: improved cardiovascular fitness, higher metabolism, and lower risk of diseases like hypertension. Moderate biking, jogging, and swimming also are very approachable ways for beginners to start exercising, or for people with age- or health-related limitations to work out. Fitness instructor Jonathan Cruz leading a 45-minute, full-body fitness class at Burn Fitness Studio. If your dream is to run a marathon or if you simply prefer more meditative activity, there’s no substitute for a jog. But if you’re looking to lose weight faster, you might be better served by all-out intervals that require quick energy. However lower-intensity activities don’t offer much in the way of muscle building. And you need to spend some time. Improving cardiovascular health requires a minimum of 150 minutes of moderate exercise per week, according to the American Heart Association, while some research suggests vigorous exercise can make the same impact in half the time. One of the best-known papers on the subject was published in 1996 by Izumi Tabata, a Japanese doctor and speed skating coach who studied the ability of different exercise routines to improve athletes’ VO2 max, a measure of the body’s capacity to transport and use oxygen, and a standard gauge of cardiovascular fitness. Five days per week, for six weeks, one group of athletes spent an hour cycling at moderate intensity. Another group spent just four minutes on the bike, pedaling madly for 20 seconds at a time and resting for 10 seconds in between. The endurance cohort raised their VO2 maximums by 10 percent, while the high-intensity group saw gains of 15 percent. Today the Tabata Method is one of the most popular strains of high-intensity interval training. In addition, several studies have shown that besides improving cardiovascular health, high-intensity training does a better job of burning fat than regular exercise. Shorter workouts may sound nice, but they are not for everyone. At Burn, exercisers must submit to circuits that can feel like lighting their muscles on fire. In a recent class Malerba-Smith and 11 others sped through dumbbell squats, lunges, burpees, and overhead shoulder presses in succession. This isn’t Gilford’s scene. He and other members of his running group, Gil’s Athletic Club, prefer a tamer environment. They do much of their running on the wooded trails of Bradley Palmer State Park in Hamilton and believe people who blast through short workouts miss out on a lot. Whatever your preference, there is a caveat: Any exercise routine can leave participants disappointed if they don’t eat right, said Sunny Blende, founder of Eat4Fitness, a sports nutrition company in Sausalito, Calif. The answer could be poor nutrition, she explained. Low-carb diets are the fad du jour and can make sense for people who exercise in long, steady sessions that tap into fat reserves. But they may not be right for people training in short, intense intervals. Carbohydrates, after all, deliver quick energy. Bottom line: “You have to pair the nutrition with the type of exercise you’re doing to be successful,” Blende said.